I haven't seen this anywhere yet but BLI is apparently going to be doing a NW2 in N scale with Paragon 3 sound. I was at the World's Greatest Hobby Show in Schaumburg, Illinois today and took the following photo at the Broadway booth. Ken said they would be out later in 2019 but didn't know all the road names yet. They are die-cast and had some heft to them so they should pull well. We'll have to wait and see (hear) how they sound ! E8/9... PA... SD40-2... GG-1... F-7... now the NW2... at what point is BLI going to stop stepping on Kato's market? At this point it seems to me to be personal. Kato certainly needs to step up to the plate in some ways (and I don't mean sound), but this ongoing model duplication is getting wearisome, and IMO wasteful, especially given BLI's mixed track record when it comes to the modeling and operability. Apparently there is sufficient market demand from customers who want their locos equipped with "the technical revolution that is the ALL-NEW Paragon3 with Rolling ThunderTM." Besides, what is the likelihood of Kato ever producing their NW2 model in that CN delivery paint scheme? Think Bachmann tooled those doors. Did they have the 2-8-2 on display? I mean if Kato isnt going to run stuff besides western roads let BLI make it. Bill, did the hood seem wide to you? My mind's eye says it looks a little fat, but maybe that's the camera angle. I'm looking at the width of the walkway. I note that the model is the later version without that notch in the hood near the cab and that it has louvered doors. So I might be able to use it, unlike the Kato model. Bachmann doors I would rate "hand-carved out of a potato." These doors a better, but not by much. For a new model in 2019, well, it's just embarrassing. 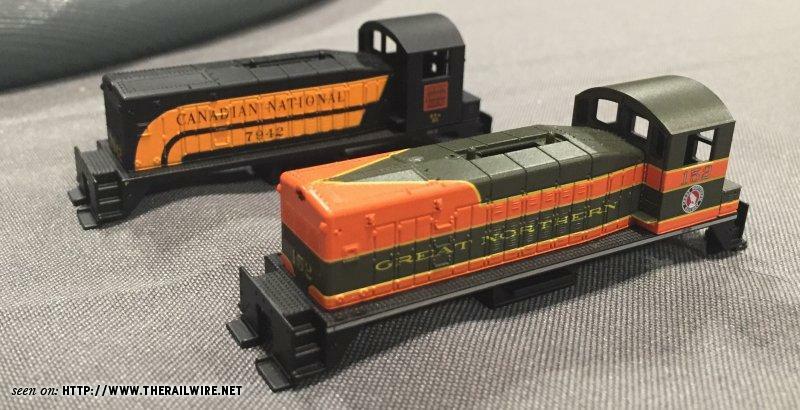 Be happy the N scale market in 2019 can support two manufacturers duplicating each other's engine offerings, well, sort of. It's been a long time since Kato ran the NW2, and if I remember the reviews right, it wasn't a home run in terms of their usual reliable operation and mechanisms. Sounds like you are unhappy at Kato for sitting on tooling, while also unhappy that BLI tries to capitalize on a perceived opening in the market, but doesn't make as quality a locomotive as Kato. I remember when no N scale company would dream of duplicating a model already offered - ala Bachmann owning the SD40-2 marker for over a decade thanks to their crappy Spectrum offering scaring away other companies from making another version. I'll take the current overlap even if I don't plan to own either company's NW2. But I agree we should ween our manufacturers off E and F units for a while. Competition, in terms of 3 manufacturers (Kato, Bachmann, BLI) producing models of the same locomotive (although different "phases" if I can apply that concept to a switcher) with different features, quality and price points should be favorable to us, the customers. Gives us choices. If they are wrong about the size of the market, well, then they end up with left over inventory, and the price falls and we get to buy them cheap. Granted, if instead of wasting time with NW2s and USRA locos, they would make an ATSF steam loco or an E1 in N scale, the probability that I would spend money with BLI would be infinitely greater. I had little time at the show and only saw this as I was about to leave. So I can't say about the hood width. Didn't notice any Mikado either but then again I wasn't really looking after being caught off guard by the NW2. Sorry I couldn't get more details. I'm sure more details will surface at the Springfield show. I completely agree. I mean, an NW2 is pretty niche. Make an SDP45 or something else that hasn't been done. In the early days of N scale, almost every manufacturer had an F7/9. "In the early days of N scale, almost every manufacturer had an F7/9." In the early days of N scale, that was the easiest way to fit a motor in the body, and almost every potential customer was familiar with F units. In many areas they were still pulling freight trains. As Aaron pointed-out, these samples appear to represent a different phase from the Kato model. The NW2 phases were pretty dramatic....pretty much a completely different model appearance-wise. The SP had both the kato phase and what this one appears to represent, so I'm certainly interested. What is also interesting about this announcement is the apparent addition of another sound decoder that is suitable for N scale loco installs, let alone a switcher. Yes, the NW2 hood is wider than, say, an MP15DC or SW1500, but I don't believe they offered a decoder that small before (although it's been a while since I looked). Regarding the hood door outlines...I really don't know why anyone would want to do anything other than the more standard approach which looks great. I keep pondering the same thing Russ, and here are some reasons I came up with: The designers of the molds simply aren't familiar with the vehicles they are modeling. Since these molds are designed overseas, they have likely never seen American Diesel locomotive in-person (or maybe even a locomotive in their country). So they only have reference photos to model from (or maybe a set of drawings). So, they might end up exaggerating the details like hood doors. Or maybe they exaggerate them because the paint thickens will hide the details? Whatever the reasons are, they keep repeating the same thing over and over. Kato and MTL are some of the very few companies which seem to "get it", and go easy on the detail relief (or "board gaps") on their models. I mean, an NW2 is pretty niche.